It is that time of the year we update the historical returns of the major indices, particularly BSE Sensex and NSE Nifty. This was a huge year for Indian Stock Markets, as they hit life-time highs due to favorable results from General Elections 2014, followed by huge FII inflows into the markets. During the year the index hit an all-time high of 28822, while the Nifty hit 8626. 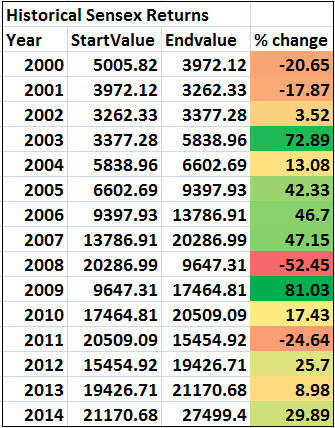 The following table shows S&P BSE Sensex historical data - start & close values and the yearly returns of the sensex from 2000 to 2014. As far as the other major indices are concerned, CnxIT gained about 18%, whereas the BankNifty gave huge returns gaining about 64% and the Cnx Midcap index gained about 55%. Despite the Sensex gaining 30% for the year there were many stocks which have lost 90% and some stocks gaining about 500-600%, many of them from mid-cap space. Despite markets hitting all time highs only a few stocks made all-time highs or the highs which were made in 2008 bull run, while most of them are still languishing well below their historical highs. The message for retail investors is clear - index investing is better than individual stocks. Unless the investor has an extraordinary stock picking skills, the Retail investors can achieve above-average returns by investing in index through Exchange Traded Funds (ETFs) like Nifty Bees or Top mutual funds, which have given consistent returns over longer periods of time.